B.S. Rensselaer Polytechnic Institute, 1961. Thesis: "Three Reversed Spin Bound States in the Heisenberg Model of a Ferromagnetic Spin System." Assistant Professor of Physics, Hamilton College, 1968-74. Associate Professor of Physics, Hamilton College, 1974-80. 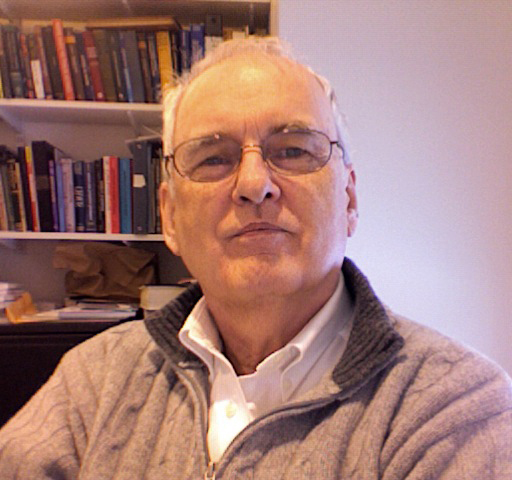 Litchfield Professor of Physics, Hamilton College, 1980-Present. Abrar Ahmed (14') "Dynamical behavior and complexity in certain evolutionary games"
Luke Sisler ('14) "An investigation of the acoustic impedance of a Helmholtz resonator"
Emi Birch ('14) "A field guide to teaching observation of the night sky"
Andrew Morrison ('14) "The Stirling Engine: Construction and experimentation"
Tae-Wook Kang ('13) "Construction of Helmholtz resonators and a study of Helmholtz resonator's Laser Deflection"
C. H. F. Peters' Friedrich-Wilhelms-Universität dissertation"
Cui (Olivia) Lin ('12) "Prisoner's Dilemma and More: Computer Model of Complex Systems Using Netlogo"
Erich Kreyling ('10) "Study of a laminar-to-turbulent flow transition"
Greg Schwedock ('10) "Entropy of a model complex system"
Emily Benzer ('08) "Investigation of the Metropolis and Demon Algorithms in Thermal Systems"
Todd Johnson ('08) "Nonlinear Dynamics of the Impact Oscillator and Human Perceptual-Motor Tasks"
Heather Parker ('07) "A Photometric Study of Variable Stars in NGC 6882"
Mary Beatrice Dias ('04) "An Analytical and Numerical Study of the Restricted Three-Body Problem." Jessie McComb ('03) "The Search for Stability: Perturbations in the Orbital Elements of Three Asteroids." Andrew Wiechmann ('02) "The computer and the asteroid: computer controlled pointing, tracking, and data reduction in the study of asteroids ." Bryan Smith ('02) "Study of jet oscillations in an edge-tone generator." Edward Nelson ('01) "Resonators: measuring pressure fields using laser deflection." J. Michael Smith ('01) "Limiting magnitude and resolution on a CCD-telescope combination and the resulting precision of asteroid orbital elements." Sarah Hall ('01) "Micrometeorite collection and analysis -- a link to the extraterrestrial environment." Jezerik Gaddoura ('99) "Shock waves: a laser deflection technique for reduced-density channel measurements." Nicole Henderson ('99) "Asteroid observation and analysis." Matthew Hornbach ('98) "Asteroid orbits: theory and reality."